Rebecca Raimondi is an Italian violinist. She is specialized on Modern period Violin solos and performs over 50 concerts a year in UK and Europe. She is now a Fellow at the Guildhall School of Music and Drama, where she obtained a Master’s degree (with Distinction and Concert Recital Diploma Award) with David Takeno, and she is also studying baroque violin with Pavlo Beznosiuk. 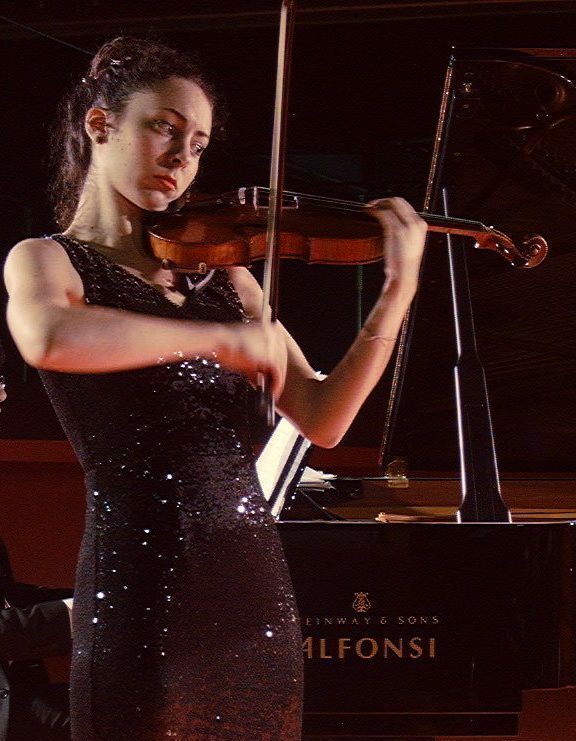 She studied with Salvatore Accardo (Accademia W. Stauffer of Cremona, Accademia Chigiana) and Marco Fiorini (Music School of Fiesole) and also, with Roberto Gonzalez-Monjas. She has founded the Ardorè Duo, devoted to Contemporary Music succesfully performing at the Accademia Chigiana of Siena, the Museo del violino in Cremona – playing on the Nicolò Amati ex-Collin 1669 -, the Festival Pontino and the Danish Institute in Rome. She has been invited by the Mantova Chamber Music Festival to play with the Imago Sonora Ensemble in a concert dedicated to American contemporary composers. In 2017 she held a contemporary music recital for violin solo at the Filarmonica Romana in the season “Assoli II”, performing premières by Marco Quagliarini and Sir Peter Maxwell Davies. With Duo Ardorè she performed the première of “Ricercare II” by Marco Quagliarini who subsequently dedicated “Ricercare III” for solo violin to her. She is also member of Rest Ensemble of Entropy Ensemble. She recently recorded the music of Michele Paradiso for violin and piano and violin and orchestra in two CDs.